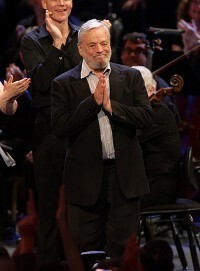 Legendary songwriter Stephen Sondheim will be honoured at this year's Laurence Olivier Awards. The American composer and lyricist will accept the prestigious Special Award in person at the ceremony at the Theatre Royal Drury Lane later this month in London. The night will end with a tribute to Sondheim, who wrote the lyrics for West Side Story, from performers including Adrian Lester. In a long career, Sondheim's other theatrical hits have included A Funny Thing Happened On The Way To The Forum, A Little Night Music and Sweeney Todd. Previous winners of the Special Award include Sir Alec Guinness, Dame Judi Dench and Lord Olivier. Among the big names handing out awards at the event on Sunday March 13 will be Sherlock star Benedict Cumberbatch, Mad Men actress Elizabeth Moss and Elaine Paige, and there will be a performance by US singer Barry Manilow. The show, hosted by Michael Ball and Imelda Staunton, will be broadcast live on BBC Radio 2. Love Never Dies, Andrew Lloyd Webber's sequel to Phantom Of The Opera, has claimed the most nominations at this year's awards. The hotly anticipated production, which opened to mixed reviews last year, is up for seven awards including best new musical and best actress in a musical for Sierra Boggess.